A UN report released on Tuesday calls for abandoning the US dollar as the main global reserve currency to achieve greater stability in the world financial system. "The dollar has proved not to be a stable store of value, which is a requisite for a stable reserve currency," said the World Economic and Social Survey 2010. Andrew Roberts, credit chief at RBS, is advising clients to read the Bernanke text very closely because the Fed is soon going to have to the pull the lever on "monster" quantitative easing (QE)". "Plan for the worst and hope for the best." China is already the world’s largest gold miner, and many analysts now assume – following the country’s announcement last year that it had been building up its gold reserves for six years unknown to the West – that it is still expanding its gold holdings in a way that does not necessarily show the gold going into official reserves. And now it appears to be looking elsewhere to purchase supplies of the yellow metal without overtly impacting the market. "In the absence of the gold standard, there is no way to protect savings from confiscation through inflation...This is the shabby secret of the welfare statists' tirades against gold. Deficit spending is simply a scheme for the confiscation of wealth. Gold stands in the way of this insidious process...It stands as a protector of property rights. If one grasps this, one has no difficulty in understanding the statists' antagonism toward the gold standard." Gold prices have once again climbed to record levels of $1264 last week before correcting on profit taking thereby cementing the appeal of the yellow metal as a safe haven for investors. China announced its move toward a more flexible currency exchange rate mechanism which has improved the investor sentiments in general but the softening of the dollar has helped the recent surge in gold prices to record levels. The common mantra we have been talking about for a long time, "GOLD IS A CURRENCY", and in times of crisis it becomes the "Ultimate Currency". This golden cycle has been repeated through out history and if history is any guide this will cause gold to rise much higher in the near term. Gold becomes your "insurance policy" against crisis and corruption. NEW YORK (CNNMoney.com) -- Foreign governments have been getting in on the recent gold rush, driven by continued fears about Europe's debt crisis and the pace of the global economic recovery. Bloomberg checked in on the state of Fannie Mae and Freddie Mac, the two once-quasi-private mortgage subsidy companies that are now almost wholly owned by taxpayers. Bloomberg found that Fannie and Freddie have already drawn down $145 billion in their unlimited line of taxpayer credit, and that their losses could ultimately be as high as $1 trillion. EU leaders are meeting this week to thrash out a rescue package for Spain as its economy teeters on the brink. GOLD Hits a NEW All-Time High Again! While you were sleeping, CNBC Europe was interviewing the founder of Gold Switzerland, Egon von Greyerz. KWN's Eric King interview's legendary Mexican businessman Hugo Salinas Price. June 4 (Bloomberg) — Gold, which touched a record of $1,249.70 last month, may rally another 36 percent as Asian central banks buy for the first time in two decades, said Michael Lewis, head of commodities research at Deutsche Bank AG. 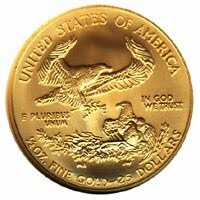 The United States Mint has indicated the availability date for fractional weight 2010 American Gold Eagle bullion coins. Authorized purchasers may begin placing orders for the coins on June 10, 2010. Orders will be subject to the standard allocation process. These smaller denominated coins are in high demand because when gold hits $2,000/oz and more, these fractional pieces offer more flexibility in trading. I just finished reading this book and it is an excellent read. Jim Sinclair and Peter Carlin do a fantastic job of presenting facts and theories in a simple format on why and how to invest in gold. The book is only 140 pages but very informative and focused. After reading this book it will give you a feeling of powerful understanding of the global financial system as a whole. I highly recommend it to everyone. *As always, we do NOT receive any type of compensation for our third party recommendations. Our only benefit is educating people on the fundamentals of gold investing. June 3 (Bloomberg) -- Rand Refinery Ltd., the world’s largest gold-smelting facility, raised production of Krugerrand coins to a 25-year high as Europe’s sovereign-debt crisis boosted investor demand for bullion. Take note folks, trends usually start in Europe and make there way to the west. Steve Wynn says Americans are afraid. He’s just angry. “Washington is unpredictable these days,” declares the CEO of Wynn Resorts. “No one has any idea what’s next…the uncertainty of the business climate in America is frightening, frightening to everybody, and it’s delaying the recovery.” (Catch more Steve Wynn's views in the videos below and on CNBC throughout the day). LINK..
Gold at $2,500 Looks More Likely Than Ever! Gold added another $11.30 Tuesday to hit $1,226 an ounce, and although the yellow metal is still well off its nominal all-time high of about $1,240 set just a few weeks ago, you don’t have to be a member of the build-a-bunker-in-Montana crowd to believe gold could hit $2,500 an ounce in the next couple of years. David Rosenberg, chief economist and strategist at Canada’s Gluskin Sheff, tends to be pretty bearish, but he’s also about as dispassionate and data-driven a guy as you can find. In other words, he’s hardly some kooky gold bug. And if past relationships among data sets hold up, gold fever is just getting started, Rosenberg says. "There is no doubt that when benchmarked against the CPI, money supply and GDP, gold can easily double from here," Rosenberg told clients in a Tuesday report. "Demand is always difficult to forecast, especially for jewelry, but we do know that central banks have very deep pockets and bought more gold last year (425 tons) than at any other time since 1964." Money Manager Dr. Stephen Leeb of Leeb Capital Management discusses the gold and silver market and a possible spike in silver to $100/oz. Over the last decade, his independently-verified performance record has been ranked in the top 5 percent among peers according to Informa’s PSN manager database.